It is always a good idea to share your first impressions of cookbooks so you’re on record with opinions you will later need to take back, like how a few years ago I announced how much I hated Gabrielle Hamilton’s Prune only to realize shortly thereafter that it was a masterwork, one of the great, spiky, original cookbooks of all time. A couple of hot new cookbooks arrived the other night and here are my thoughts after spending an hour or so looking through them. In case you do not know already, Molly Yeh is a gorgeous, exuberant, and very young food blogger who once studied percussion at Juilliard and now lives with her adorable husband on his family farm in North Dakota where she bakes a lot of really tall, really cute, cakes. She is immensely popular. Popular as in 172,000 Instagram followers. She doesn’t use capital letters, she’s always smiling, and everything she photographs looks dreamy. That sounds insufferable, but somehow isn’t. She’s just too bubbly and happy to be insufferable. Yeh’s first book is, at first glance, charming. I have not read all the stories about her life and I’m not sure I will, but I love the look of these recipes. Yeh likes to pile a lot of delicious things into a dish. You could call these “embarrassment of riches” recipes. Walnut crusted brie mac and cheese with apples and pancetta. Dark chocolate marzipan scone loaf. Scallion pancake challah. Butter and salami pizza. Tahini blondie ice cream sandwiches. What could be better than a steamed Chinese bun? A steamed Chinese bun folded around crispy schnitzel. What could be better than that? A steamed Chinese bun folded around crispy schnitzel with Sriracha mayonnaise. I’m not Molly Yeh’s perfect reader. I’m too old. Will I soon find myself smiling indulgently and patiently and mailing this book to Isabel? 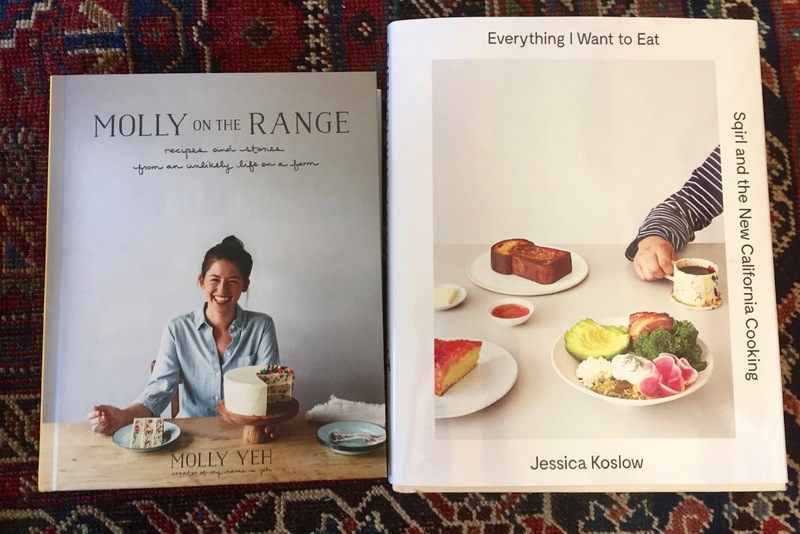 Jessica Koslow is not quite as young as Molly Yeh, but she’s pretty darn young. She owns the exquisite little Los Angeles restaurant Sqirl where I once ate a very nice breakfast, some kind of crunchy savory rice dish the details of which are vague but the overall wholesome goodness of which remains vivid. Her book is harder to warm to than Yeh’s, more serious, edgy, modern arty. 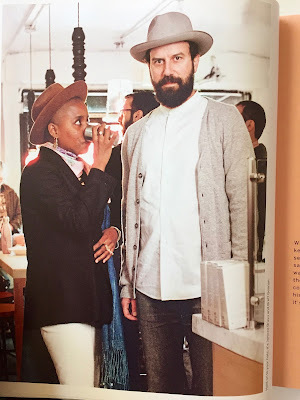 I find the design a bit off-putting, the unsmiling faces of striking or semi-famous people who stare out from the photographs disconcerting, like I just arrived at a party where everyone is cooler than I am. Where Yeh tries to pack as many crowd-pleasing ingredients into a single dish as she can, Koslow is more apt to pair the pleasant with the not-so-pleasant. Koslow will often emphasize something slightly “scary” about a dish, be that a color or an ingredient, something that will turn some people off (like my husband), but excite and challenge others. Beet-cured salmon. Kohlrabi tzatziki. Stinging nettle cavatelli. Black cod ceviche with purple yam. Carrot ginger black sesame loaf. Just the colors in the names of those last two dishes would make Mark anxious. I don’t want to overstate this tendency. You might not even notice it if you hadn’t just been romping around in the marzipan fairyland of Molly on the Range. Based on my lukewarm first impression, I will probably end up cherishing Koslow’s book. The cookbooks (and people) I end up loving the most are the ones I have trouble with at first. And in Korean cooking news, japchae, the classic slippery dish of sweet potato noodles with meat and vegetables was a giant hit. Owen went crazy for it and asked me to make it again and so I shall. Leftovers reheated beautifully in a skillet. I used Maangchi’s recipe from her book, but the version on the blog is not all that different. Just double it. I skipped the egg. Highly recommend. Lately I am very, very aware of young everything. It seemed to happen overnight. Should you be asked to review "Pooles," Ashley Christenson's first book, it's worth a try. We held the rehearsal dinner for our son's wedding at one of her restaurants and the food was simple, perfectly prepared and so, so good. There are some laborious preparations and some shortcuts - a nice vinigarette that keeps well and "make your own" pimento cheese which seems insane. But probably worth a try. Anyway, love your blog and am always happy to read what's on your mind and on your stove. Not sure about Molly Yeh, not sure my partner will like what I cook out of Sqirl, I have the same experience with loving those I find difficult at first, and I need to try that japchae. I tried to comment in list form to keep with the young writer theme of this post. Mark is going to hate the Sqirl food. Maybe I'm just getting crotchety in my old age and want those noisy kids to get off my lawn, but both those books look annoying in different yet vexingly similar ways (the preciousness of it all ... ) but that said, I'd probably cook from Koslow's book more than Yeh's. Also, it's like everything they do is the first time anyone in the history of the world has ever done that thing -- no one else ever moved from a big city to the rural Midwest! no one else ever made jam! -- and they have to explain it all to you. Oh trust me, I'm right there with you feeling grumpy about those kids today. I'm trying to look upon them with maternal solicitude. I'm not quite old enough to be Koslow's mom (I don't think!) but I'm definitely old enough to be Molly Yeh's. P.S. The japchae looks great! That's on my list to make, it would be a hit here as well. Thanks for the link and recommendation. I love japchae. And I will be glad to know your opinion of the Molly Yeh book! I have a love/not love relationship with her site (it never goes so far as hate)-- she is so breathless and freaking adorable and fabulous and people pay her to go to Ireland and Hawaii and hang out with friends and make food and take pictures-- and she did one post recently where she wore Old Navy clothes and appeared in adorable sponsored modeling photos around her farm. So, you should hate her, right? But yet somehow you don't, somehow she actually SUCCEEDS in being that adorable. I have not had superb luck so far, however, with her recipes (from the blog). They look cool but sometimes flavor seems secondary. I will be interested to know your results. Oh no, I'm sorry to hear the recipes are bland. I had a feeling her tater tot casserole might be lacking something, but I'll probably make it anyway. I don't know that I would use the word "bland." Just... beauty comes first. Also, she clearly likes her desserts to be barely-sweet, and-- while I don't normally go for cloying-- I find the lack of sweetness kind of unsatisfying. I dunno, I've only tried a few things so may have just not had the best luck. Ok, I will try some of the recipes and see what I think. I'm not sure I can "afford" to make many desserts right now weight-wise, but when I do, I definitely like them sweet. I am not generally a fan of precious. I will reserve judgment on both of these until you report on recipes, but I would not buy either of these cookbooks. The japchae looks wonderful, but I know my husband would not eat it if it is slippery. He is driven by texture in his eating. I bet you were pumped to have Owen request that you repeat a dish! It is so gratifying to cook something that everyone likes, and it doesn't happen to me unless I cook the classics. For that reason, I have been interested in improving my technique lately and perfecting those dishes that are appreciated. Boring? Sometimes. But I have found that small improvements in my technique makes a huge difference in the dish. Any recommendations in this venue? A book recommendation - The Last Painting of Sara de Vos by Dominic Smith. Highly recommend. Agree on The Last Painting.....I listened to the Audible version and liked it a lot! I don't know about technique books, Beckster, but I do know what you mean about perfecting dishes, getting better at the things you really love as opposed to trying new ones. What dishes are you trying to perfect? And thank you for the book recommendation. I put it down on my list this morning and will seek it out in the near future. I am not trying to perfect certain recipes, per se, just techniques that improve my rendition of those recipes. I am probably not explaining myself well. I think that I learned to cook on the fly and never really learned the science or maybe even the art of cooking. I tried to read Ruhlman's books, but it just didn't do it for me. 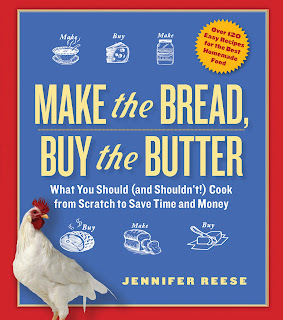 Maybe I need to go back and read Julia Child or some other books that resonate with the techniques of cooking. If the people in my life will not allow me to be adventurous, I was thinking maybe I could get better at what they will accept. My husband is in very poor health, and I am not going to try and feed him things that he doesn't want at this point. I'm very sorry to hear your husband is in poor health, Beckster. The last thing you'd want to do is feed someone who is ill food they don't like! I suppose you are talking about those little tricks that make things just that much better, like some writers will tell you to take the little kernel out of the middle of your garlic cloves, things like that. I guess I would just read recipes, different versions of the same dishes. You pick stuff up. Well that's something I have never read! Take the kernel out of the garlic clove? You mean I have been using garlic incorrectly? (Kidding.) Yes, I think I probably should go back and read some tomes about cooking. I do love to read cookbooks. My husband has been in very poor health for a while, and during that time I have continued to try new recipes when I thought he might enjoy them based on ingredients. But, he wants the familiar, and I understand that. So I will have to experiment vicariously through you and cookbooks. You're right, by reading, you pick things up. Beckster, two books I own that have a lot of techniques that improve flavor and inspire cooking are tom colicchio's Think Like a Chef (don't love his tv persona but this book is a reallativly slim, very thoughtful book that addresses how flavor and technique interact, for a moderatly able home cook) and then Martha Stewart's Cooking School (huge, precisely edited with the Martha viewpoint that I love but others find off-putting) which has a lot of beginner info but plenty for those more skilled. I am so sorry your husband is ill. I hope in taking care of him, you find a little time to care for yourself. Cooking is my refuge. Thank you so much to both you and Jennifer for providing emotional support. I don't want to take over the blog talking about my husband's poor health because it has been a fact of life for me for some time. It's just life. It is occasionally frustrating for me in my kitchen adventures, but probably not as frustrating as it has been for him. I have finally realized that I just need to feed him what he wants, repetitive as it may be. So I really appreciate the book recommendations! I will look into both of them and continue to watch the kitchen adventures of the Tipsy Baker community, which, by the way, I treasure. I would be interested in hearing any comments you make about Pooles Diner; it looks interesting. I don't know about Molly Yeh's recipes, but I want to read her stories. Perhaps the Kindle version would be good for me. Her stories are cute, the ones I've read, anyway. I'll check out Pooles diner -- as I mentioned to a previous commenter, it got a kind of bad review on Eater, but I'll see what I think for myself. I am clearly not only an awful person, but an aged one. Yes! It is punctuated. Fear not. I so miss the days of Julia Child, when a woman could be a success without having to espouse an entire lifestyle and feature copious pictures of herself trying to act as if she doesn't know she's adorable. In both of these books a kind of false modesty abounds. It's the result of our culture rather than the responsibility of these two authors but really, can we please have some cookbook author just be a normal person for a change, who isn't constantly, "effortlessly" perfect in every single dimension of their cooking, their image, their blog, their work? Real people are so much more interesting. This is a roundabout way of saying, Tipsy, that I remain a devoted fan of yours, though I've been silent in the comments lately. Please keep up what you're doing, not only because I enjoy your writing and perspective so much, but also because the comments and the community here are so lively and real. Hear hear Maggie. I too am a silent but devoted fan of Tipsy and the Tipsy community. Absolutely my favourite blog. I live in Australia and have a real curiosity about life in America. Could it be possible that it's not so different after all? Thanks for sharing so much of your life Tipsy - I love everything you write. I wonder if we, who are now "older", were as irritating as some of the younger people are now? I'm willing to bet my money on the fact that yes, yes we were! I find I am not irritated, just a little bored, as in yeah, I remember that stage. I've been trying to think of the food writers that I loved in my 20s. Bill Neal, Laurie Colwin, Marcella Hazan, Barbara Tropp. . . It was a different time, no food blogs, less focus on lifestyle and appearances, though I think the fascination with Laurie Colwin was partly about lifestyle. The looks of writers and pictures of their food and kitchens were far less important. Not important at all, actually. Yes! Thank you, Maggie. That is perfectly put. Although Anon 6:59 (sounds like a Bible chapter, doesn't it?) has a point too -- we've all got to reinvent the wheel and believe that no one has ever done that or been as [cool] [hip] [phat] [groovy] as we are, ever. Right on, Maggie! (Can you guess my age by that comment?) I remember Julia dropping things on the floor, then picking them up and saving them. I can't imagine one of these bloggers doing that, but I must admit, depending on what it is and how much effort I have put into said object, I have done the same. I find real people with their foibles much more interesting than air-brushed perfection. There is a place in Koreatown that serves a heavenly vegetarian version of japchae and I get it al the time. It's one of my favorite things to eat! Jessica Koslow, on the other hand, scares me. You made me laugh out loud .. about putting those two in a room and closing the door. Wait, why does she scare you? I'm curioous. Sara, it's because that photograph of her is so unsettling! 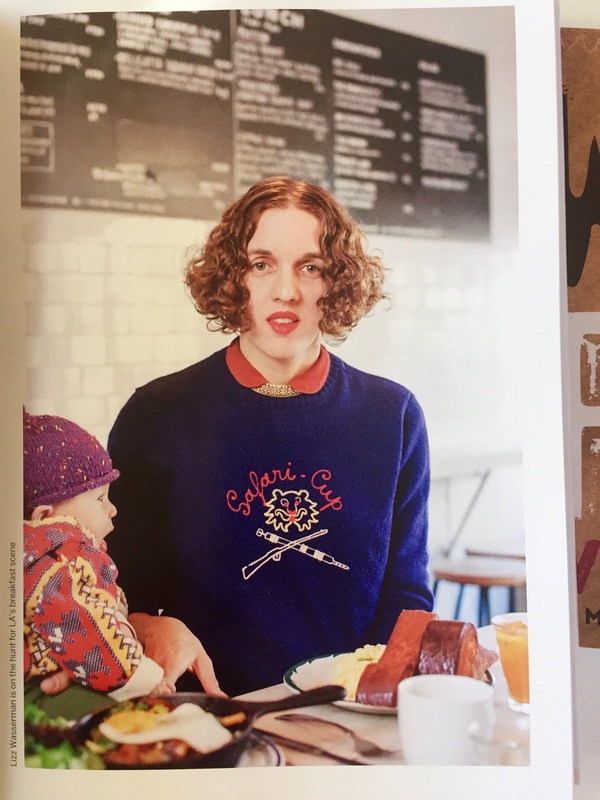 That's not her in any of the photographs Tipsy Baker has posted here. Who is the red headed woman? One of the many Sqirl customers photographed in the book. Loved these two reviews and will probably never pick either one up. However, I remain hopeful for more, much more, Korean exploits on your blog. Oh please! I will definitely try the japchae very soon. Have you ever considered fooling with Julia Reed's books? Too rowdy? P.S. your writing is the smartest blog out there. More Korean is coming. It's been a weird fall, lots of traveling for both Mark and me. (When I'm alone with Owen it is very tempting to just eat quesadillas.) This week I want to make a Korean-ish dish called "butter dumplings." I'm sorry, but anyone past middle school who refuses to use capital letters -- especially when that person makes a living writing gushy, sparsely punctuated stream-of-consciousness sentences that are like a hurtling car without brakes and the only way to bring them to a halt is by piling up !!!! at the end of them -- is insufferable. Just spent some time on Molly's blog and just love this quote: '"my travel guides are] not authoritative i-know-more-than-you guides, they're usually more like 'look, i was kind of drunk in hong kong and ben the bassoonist ordered nepalese dumplings from a secret kitchen and i don't know what was in them or really how to acquire them but you should try to find them.'" Perhaps not "I-know-more-than-you", but definitely I'm-cooler-than-you. i think the reason they all irritate the crap out of me is that they ALL believe they are the first to ever do anything. Gad...now they're all getting pregnant and having babies. It's all about getting the most followers to make money from advertisers. Seaweed, rice cakes, Christine, Paterson . . .